Karlos began to amass a collection of original Don Post masks and, while many were traded off through the years in favor of musical equipment (Karlos’ other great love), he still has many today. 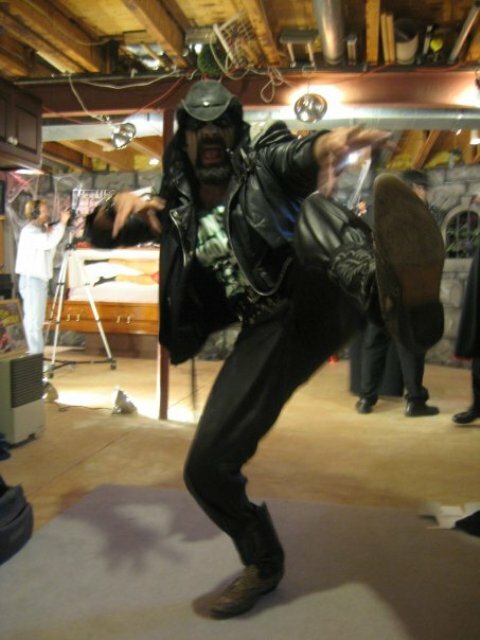 His Darth Vader and NOSFERATU masks have made their way on camera for his own “Monster Madhouse” while his own creations have become the cornerstone of the show itself. In the past five years, Karlos has created over 20 monsters for his show. He does this not simply to sate his own fan fervor but with a watchful eye on his younger viewers as well. 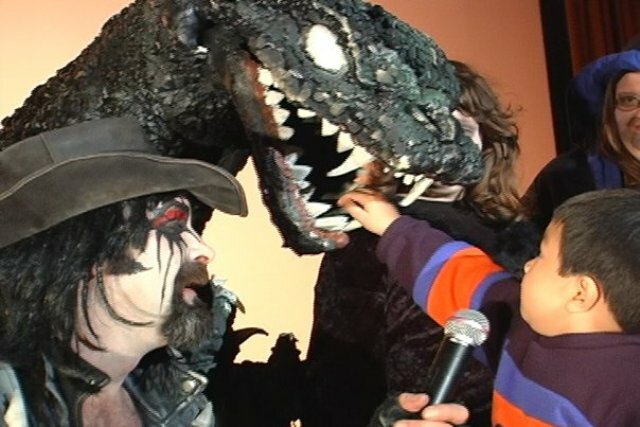 “I believe that monster masks are a very important part of the proper mental development of monster kids,” he explains. His theory is far from being without merit. Anyone who has children or spends any time around them knows that male/female kids alike ALL like to engage in a little dress up. Go to any toy store today and you will find a SPIDER-MAN costume prominently on the shelves – long after the movie franchise and Halloween seasons have ended. Indeed, a child who wants to play act the role of a super hero has plenty of options in today’s world. But what of the child monster fan? Every year since 2004 I have attended the annual G-Fest in Chicago. This small convention, dedicated to Godzilla and Japanese Kaiju fandom, features among its many activities a home made costume parade and contest. Each year it seems to attract more and more participants as the costumes become even more intricate. Not wanting my kids to be left out, I have also tried my hand at it – usually with disastrous results! 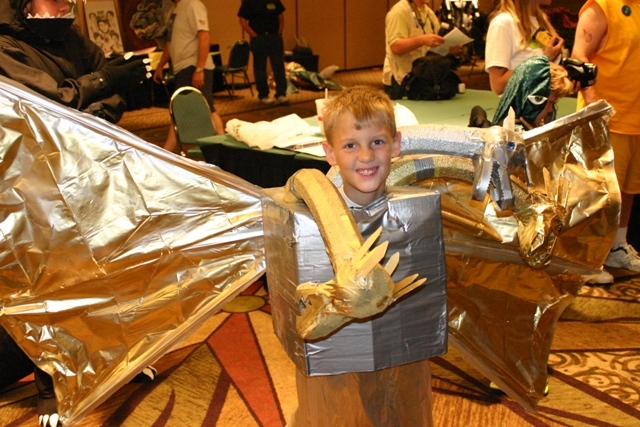 By the time my son finished the parade, Mecha King Ghidorah had fallen apart without the aid of Godzilla! Karlos’ theory intrigued me because it not only reminded me of my past costume attempts but what had gone on behind the scenes at G-Fest. While the children in costume waited in a separate room to begin assembling for the parade, many of them literally brought their characters to life! They’d begin walking and moving just as their silver screened counterparts would, while many would also begin belting out their signature roars and sounds. Naturally this led many of the children to begin duking it out and play acting their parts to the hilt. No one ever got hurt and you could tell that, for these kids, it was a rare opportunity they were not about to miss! 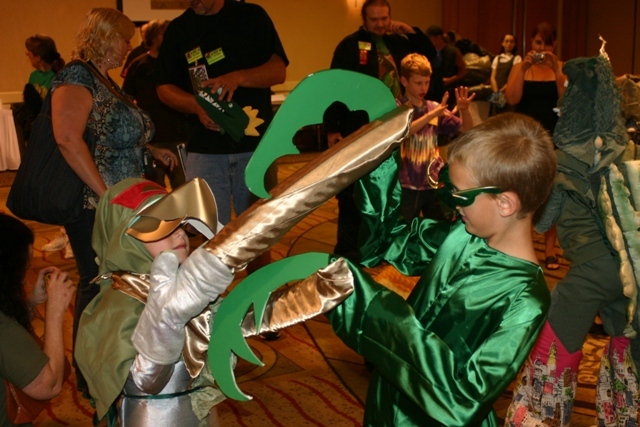 Gigan and Kamacuras due battle at G-Fest! On Karlos’ Monster Madhouse, kids need no special occasion to delve into this sort of play. 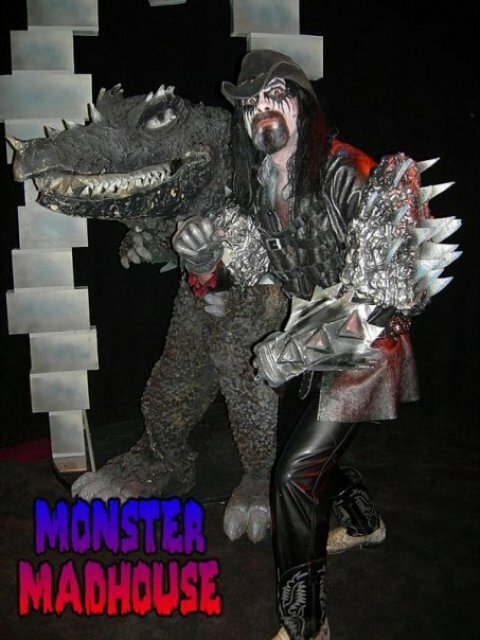 It is his belief that monster costuming and battle is an important “formula that needs to be passed on to the younger generation.” He extols this belief by generously sharing his costumes with young fans and watching them bring his own creations to life on camera. It strikes a cord not only with those fortunate enough to be wearing those costumes, but also for the younger viewers at home. 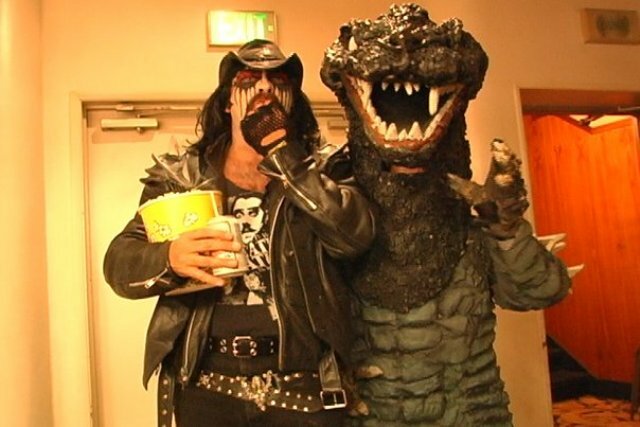 During a recent viewing of Karlos Borloff’s presentation of WAR OF THE MONSTERS, my 7 year old son was glued to the set , cheering while watching a Karlos inspired costumed skirmish. Clearly Karlos has managed to not only retain his own monster memories but translate them to a younger generation. This is a rare gift for anyone and essential to the world of horror hosting. Ingratiating today’s youth to our favorite genre of movie insures that it will continue on for future generations. It gives it an immortality that today’s digital world has all but killed. Through the charismatic antics of Karlos Borloff and his colorful cast of characters, young viewers today are given the CREATURE FEATURES of yesteryear and an outlet their instant gratification & DVD world denies them. For this, Karlos Borloff is a true pioneer. 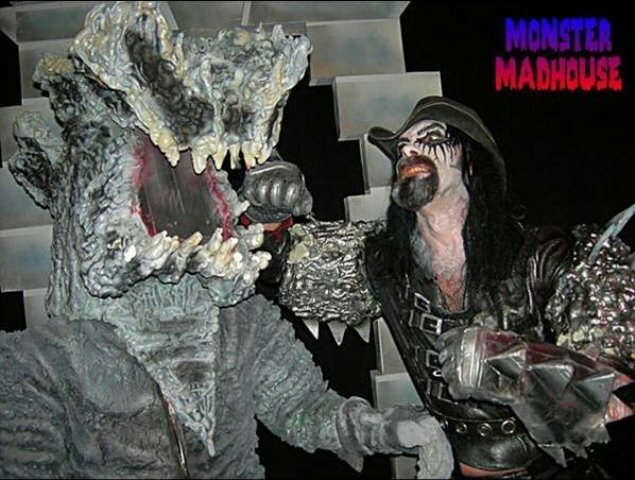 This entry was posted in Horror Hosts, Masks, Models, & Props!, Monsters and tagged G-Fest, Gigan, Kamacuras, Karlos Borloff, Mech King Ghidorah, Monster Madhouse, Monsters. Bookmark the permalink. Thanks Evelle! Dr Destruction said you may be sharing a booth with him at Horrorhound. We plan on spending quite a bit of time there and look forward to meeting you!